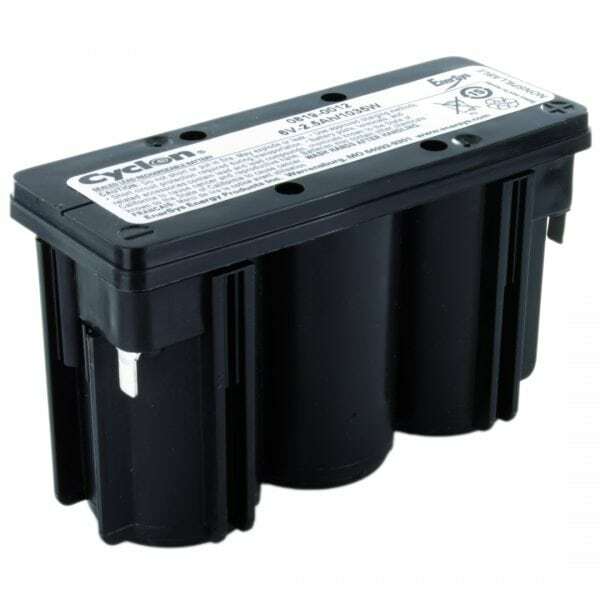 The EnerSys Cyclon 0819-0012 is a pure Lead-Tin rechargeable Monobloc pack made using 3 x Cyclon D cells. Because of the sealed design, a Cyclon Monobloc can be oriented in any position for ease of installation. The purity of the materials used is the key to supporting the Cyclon batteries performance benefits which include a longer service life, combined with higher reliability and fewer system failures, which results in an excellent cost-usage ratio. Cyclon Monoblocs will deliver up to 300 cycles (100% DOD, C/5), experience no “dry out”, have a high stable voltage delivery and flat discharge voltage similar to that of NiCd cells. Cyclon cells emit minimal to no gassing under normal charging conditions and are safe for installation in offices, aircraft cabins, hospitals or any other environment. Their rugged construction and strong external packaging mean Cyclon cells can withstand extreme temperatures and harsh usage.